"if you don't plan on getting it why are you reading this" well you got me. I actually kind of want the movie. The full frame has been cropped for this version, which means that a considerable portion of the top and bottom of the frame (representing thousands of hours of artistic labor) is no longer visible. This is deeply upsetting, enough so to warrant me not purchasing this title. Of course I bought the DVD on the first day of release here in Vienna, Austria for 17,90 Euro, only to learn the next day it had decreased to 14,99 Euro. Man, it is impossble to buy something nowadays without feeling having overpaid for it. Although I would have paid 20 bucks for it as well. Beautifully done, this DVD. However, my bigger complaint has to do with Buena Vista Home Entertainment (BVHE) or whatever they call it nowadays. The German/Austrian company is absolutely not interested in maintaining the quality image of Disney. 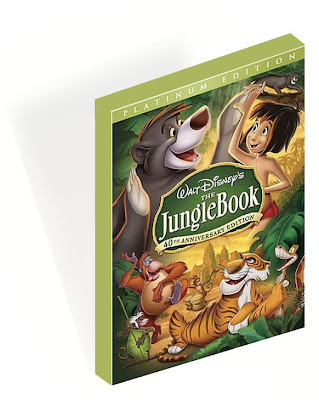 First of all: the Jungle Book DVD was released in the same week Ratatouille came into theaters (Yes I know, it is almost half a year ago it went statewide in the US, but hey, who cares?) On the JB DVD was a trailer for Ratatouille, claiming it was now available on DVD and Blue Ray! It just came out in the cinema for crying out loud! So here we are: children wanting to see this rat movie, which is advertised all over the city, and parents seeing they won't have to pay the high entrance fee for the cinema by buying it on DVD. But here comes the disappointment: it isn't available on DVD! Not even in the States. What have they been thinking at BVHE? I did an internship at BVI in Brussels and was amazed at its level of quality and care, that went into each and every campaign. But it strikes me over and over again how careless the branch for Germany/Austria is operating.